The Regional Transportation District (RTD), the regional authority operating public transit services in eight of the twelve counties in the Denver-Aurora-Boulder Combined Statistical Area in Colorado, is starting the new year off with the announcement of a new smart card program, according to The Denver Post. As part of the new electronic transit fare program, bus and light rail users will electronically load and manage a reusable smart card, with an embedded microchip. 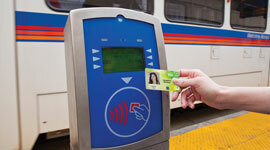 Bus riders will simply tap their card on a reader, show the attached photo and board as usual. Light rail users will board in a similar fashion, only with more options when picking their routes. The RTD has already begun implementing phase one of the $15 million overhaul on its fare system, which is aimed to speed boarding times, eliminate counterfeit tickets and significantly reduce cash transactions from both riders and employers. Phase two of the system is scheduled for later this year.